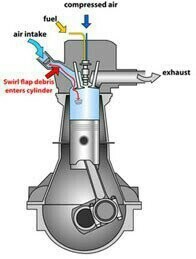 Swirl flaps are located in the inlet manifold and are designed to create a tumble of air to assist combustion when the engine is under light load. The logic behind them were to try and improve economy but have proven to have little effect. Due to the poor design, these flaps are a ticking time bomb. When the rivets holding them together break, bits of metal are sucked into the engine causing catastrophic damage. We can remove the swirl flaps and fix blanking plates in place to prevent the inevitable happening.